In my previous article, I shared on why auspicious timing is important for major events in our life. The example I used shows the negative effects of an inauspicious timing used for wedding. This time, we take a look at how the birth timing of a child is crucial for his/her health. The following is an actual chart of a 9 year old boy who was born in an inauspicious timing. 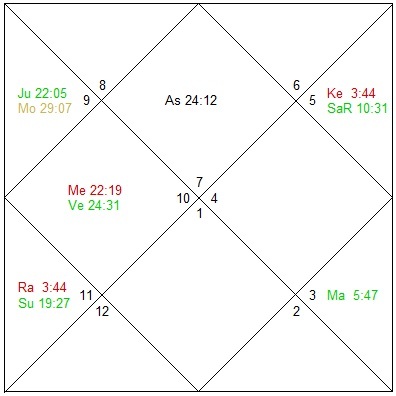 The functional malefics in this chart are Mercury, Rahu and Ketu. So the first obvious thing we can see is that the 4th and 10th house is badly and strongly afflicted by Mercury. Since the 4th house represents basic education, the child will have great difficulty completing his basic education. The 10th house represents his career and hence he will also face great obstacles in that aspect when he grows up later on. The Ascendant lord (Venus), which is the determinant for health, conjuncts closely with the functional malefic (Mercury), resulting in poor health and tendency for serious illnesses due to the close affliction of 2 degrees. The 5th Lord, Saturn, represents his intellect and it is well placed and strong in the 11th house. However, if we look at the other significators of mental abilities (Moon and Mercury) it is actually quite bad. Mercury is weak as it is residing in an afflicted house (Mercury itself is causing the affliction as it is 2 degrees from the most effective point of the 4th House). The Moon is extremely weak due to extreme old age. Also, the determinant for marriage (Mars) is closely afflicted by Rahu and thus his chance of getting married is very low. Mars rules courage and initiatives and hence these will be lacking in the child as well. In summary, we can see that the child will have lifelong health issues, relating to his intellect and mind. This will in turn have negative impact on his basic education, job and even chance of marriage. The Reality: This chart belongs to a child who was diagnosed with autism at 4 years old and is currently attending a special school. Given that his Saturn is strong, well placed and unafflicted, there may be improvement in bhukti of Saturn. Nonetheless, the above case study illustrates the importance of choosing a timing for caesarean child birth rather than taking chances through natural birth since the situation can be clearly foretold by the astrological chart. While there will be parents who would never consider a caesarean delivery, the implications can have a lifelong impact on both the parents and child. In cases where due to medical reasons the doctor strongly recommends caesarean delivery, then wouldn’t it be better to choose a good timing to do so.